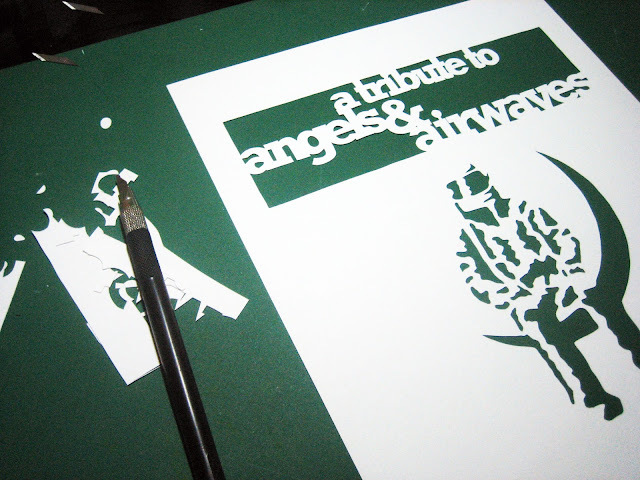 Remember my cutting of Angels and Airwaves' astronaut? I am so grateful that so many fellow AVA fans appreciate that. 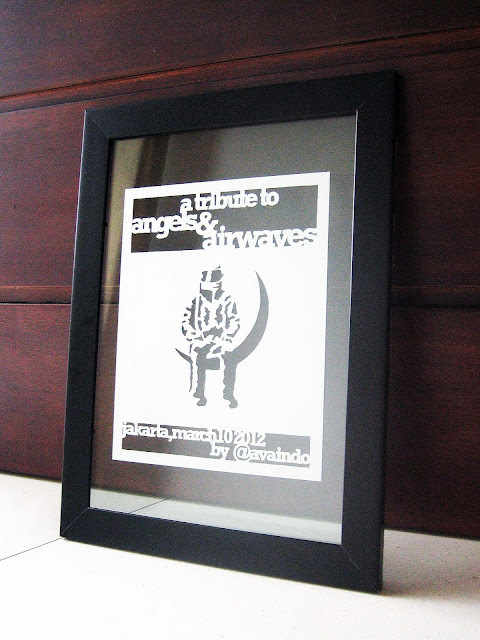 About a month ago, the organizers of A Tribute to AVA asked me if I would make another cutting of the astronaut as a souvenir/token of appreciation from AVA's Indo fan base (AVAIndo). Dare I say not? I am honored and again, grateful, that I got to make that cutting for the band and even more, got the chance to present it to David Kennedy in person. I look like a college student presenting work during crit session. While I was re-packing the framed cutting into its box, David told me that Matt, their bassist does some cuttings, too, but the big-scaled one. 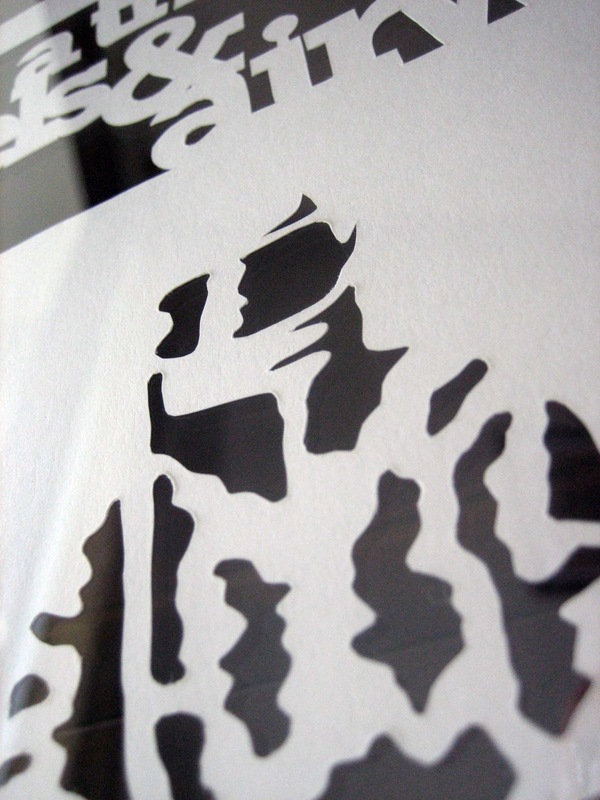 He did a large scale astronaut cutting as a spray-paint stencil. I immediately recognised their keyboard stand that they've been using recently, saw it on one of their youtube videos, a silver colored electone-like structure that's covered in artistic drippy black astronaut graphic. He confirmed my guess, that's the one Matt did. Well, so I told David to make sure Matt sees my cutting. He will be traveling to maybe few more cities before he flies back to the states, I really am not 100% sure that the frame will not break (It's padded and everything, but, glass on glass frames look so fragile, yikes!). 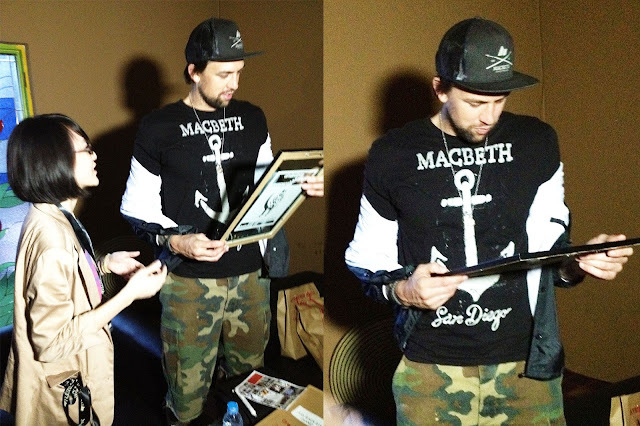 Oh, but on technical side, I would like to share a problem I faced, in which, by the time I was about to present the gift, the artwork went slightly slanted from its perfect position. I hand-carried it thru some walking, a bus ride, some more walking, a car ride, some more walking and then some seeing-a-concert, so it went through a lot of bumps in that packaging. So, I will make sure a better framing next time, and probably a slightly thicker paper (I used 160 gsm for this). That's it! I had a great time yesterday, I hope you did too! Oh, I got my original work signed by David, too. 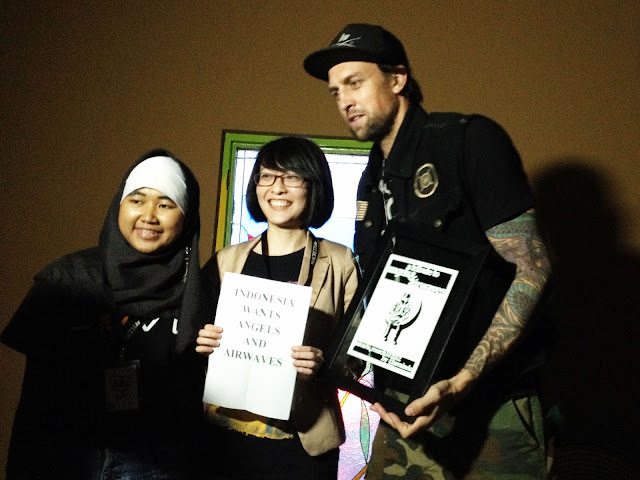 Thank you to Jon Goodson, Sena Mahesa and Mareta R of @avaindo.